It’s been a few weeks since our last hike. We usually do several races between February and May and the training for those leaves us a little less time for hiking. Really it is nice to have the running because a lot of the trails are still snowed under and the weather isn’t always conducive to hiking. We are trying to fit a hike in every few weeks though to get prepared for our peak hiking season. 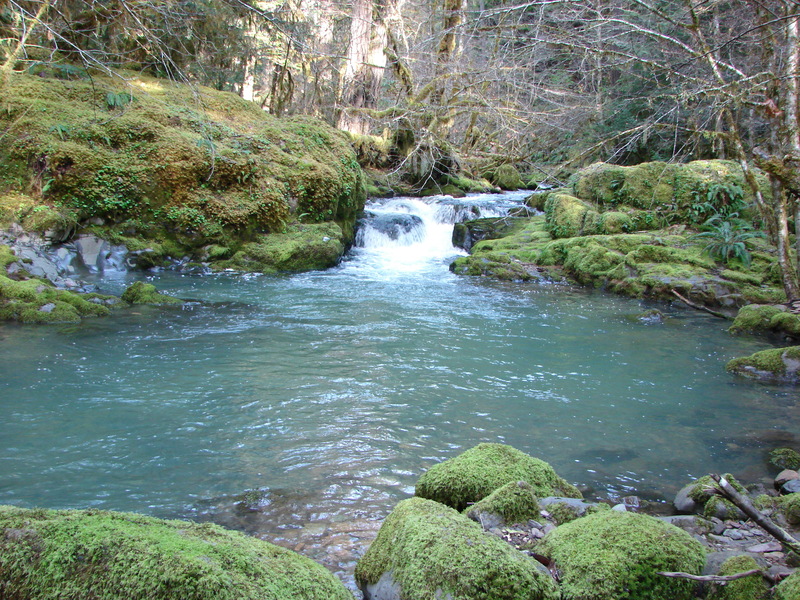 Our most recent hike was up Larison Creek which is just East of Oakridge, OR. We had not done any hiking near Eugene or along Hwy 58 yet and were looking forward to exploring a new area. The weather cooperated and we had a dry and mostly sunny day. It was a chilly 31 degrees when we set out, but (Aside from some chilly fingers which was our fault for not bringing the proper gloves.) it didn’t seem that cold. The hike starts next to Larison Cove which is a milky green color. This is partly due to Blue-Green Algae. The trail slowly climbs along the creek through a moss covered forest. At times the forest floor seemed as if a layer of green snow had fallen covering everything. Small Snow Queen flowers bloomed along the first portion of the trail adding a splash of purple to the greens and browns. Larison Creek flowed within earshot, and was often in view. A couple of short paths led to clear pools below small slides or chutes that were worth the slight detour. As we gained elevation beargrass and rhododendrons became more common, but it was too early for them to be in bloom. We eventually ran into some patches of snow displaying the transition from Winter to Spring. 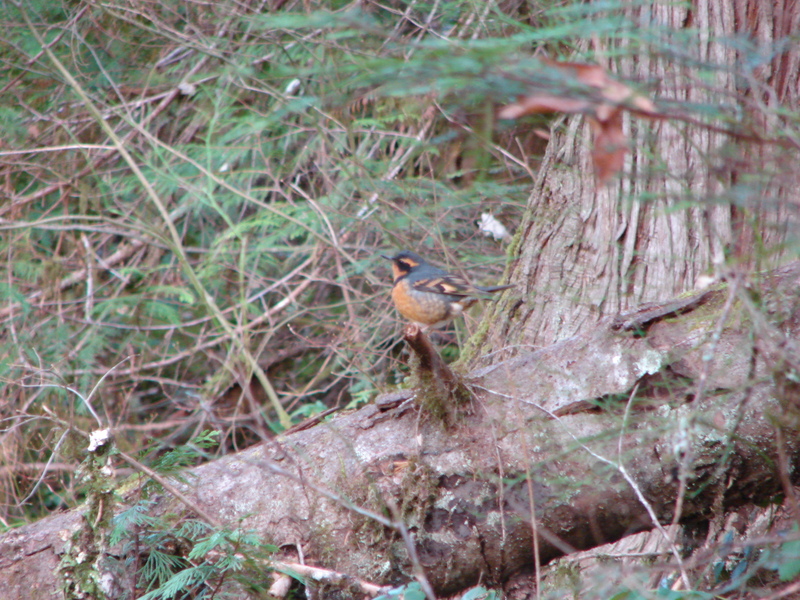 Wildlife was limited to birds, most notably the first Varied Thrush we had seen. Despite his posing for some pictures I was able to get a very clear shot as you can see here.